A panchayat that was held to decide the gotra issue at Hadodi village under Badhra subdivision today, asked the couple, who got married two months ago, to leave the village within a month. A march was today held in protest against alleged police inaction over an assault by BJP activists on Ambala Cantonment MLA and Independent candidate Anil Vij on the night of February 2. Independent candidate and MLA Anil Vij leads a march in Ambala on Sunday. The Army has ordered the Court of Inquiry into the firing incident which led to the death of a labourer yesterday in the cantonment. Doctors from all parts of the state as well as from Delhi, Punjab, Rajasthan and Uttar Pradesh updated their knowledge regarding the latest advancements in medicine and surgical techniques at a conference organised here today. Cold and shortage of fodder seem to have taken toll of more than 20 cows and bulls since January 1 at the Haryana Government’s Mandewala Gosadan here. The city of Sonepat is stinking due to the callous neglect and apathy of the authorities towards the basic need of the people. Rampant corruption and petty politics by the officials concerned makes them least concerned about providing basic amenities. For about 100 families of beggars living in hutments along the bank of Western Yamuna Canal (WYC), the ongoing Assembly election process has no meaning as they are busy earning livelihood by begging in streets of Yamunanagar and Jagadhri. These families have never voted ever since they settled here in 1974. Two persons were killed in a road accident near Dighal village on the Rohtak-Jhajjar road last night. The bodies were found lying near their car, which overturned along the road. The owner of a cement factory was killed and five others were injured in two separate road accidents during the past 24 hours. A panchayat that was held to decide the gotra issue at Hadodi village under Badhra subdivision today, asked the couple, who got married two months ago, to leave the village within a month. After that they would have to pay Rs 50 daily as fine if they failed to leave the village. The panchayat has also said that if any person or member of the family continued relations with the couple, they would be fined Rs 1100. The panchayat categorically established that the social boycott of the family of Chander Singh Maan, father of the bridegroom, could only be withdrawn if the latter evict the couple from his moveable and immovable property and apologise publicly. The panchayat, which chaired by Mr Mange Ram Mangla, was largely attended by representatives of Hadodi Nangla, Jeetpura and Umarwas villages. The panchayat adhered to its previous decision of ousting the couple from the village. Earlier, the panchayat that held on December 25, had directed the couple to leave the village within a month and its limit had ended on January 25. Due to Assembly elections, the panchayat had fixed February 6 for the next meeting. Five panchayats had already been held in this connection. The gotra issue came to light when Chander Singh Maan fixed the marriage of his son, Veerpal, with the niece of Sheoran gotra. Sheorans live in Hadodi village. A panchayat was held on December 13 that asked Chander Singh to break the engagement and not to solemnise the marriage. Though he accepted the verdict but later solemnised marriage of his son on the fixed date, on December 14, which irritated the panchayat members. A panchayat held on December 15 ordered of social boycott of the family of Chander Singh. Mr Vij, joined by a number of protesters, led the march through the main markets of Ambala Sadar. Addressing a gathering at his election office on the Nicholson road, Mr Vij said the incident had spoilt the atmosphere of the town. “Dr K.D. Sharma of the BJP had yesterday tried to mislead people by claiming that I have not suffered any injury. I demand a medical board to examine me to prove that I have sustained a fracture in my hand,” he said. Mr Vij said the police should register a case against the owner of the car used by the attackers. “There should be a high-level inquiry into the matter,” he demanded. “I am also unhappy with the role of the Election Commission,” he added. “If the authorities concerned do not take prompt action, we will be forced to intensify our struggle,” he said. In a statement issued today by the HQ 14 (I) Armd Bde, it stated that the Army had put Naik Jagat Narayan Singh under arrest. “The police has been apprised of the action being taken and has been assured that Naik Jagat Narayan Singh will be made available as and when required by it,” the statement said. “The labourer, Sarwan Kumar, and few other labourers were working on the construction of a water tank in the Army unit. They requested the sentry, Naik Jagat Narayan Singh, to show them how his rifle worked. The sentry agreed to show them how it worked, and during the demonstration, accidentally fired the rifle resulting in the injury to the individual,” the statement said. The statement further stated that “Sarwan Kumar was immediately rushed by the Army authorities to the Military Hospital where he was given all necessary medical aid. As per the procedure, once he stabilised with the help of Army authorities, he was shifted to the Civil Hospital in Ambala Cantt. He was, thereafter, referred to Government Medical College Hospital, Chandigarh. However, it was learnt that Sarwan Kumar died yesterday while under treatment. Specialists and super-specialists in various medical disciplines participated in the annual conference of the Academy of Medical Specialities of the Indian Medical Association, Haryana. It was inaugurated by the Secretary of the academy, Dr Ajay Gambhir. Dr A.P. Setia, Chairman, and Dr Sanjay Sharma, Secretary, Haryana Chapter of the academy, said the latest research in diabetes, angiography, renal stones, laparoscopic surgery and headache management were discussed during the conference. The experts in various branches of medicine and surgery deliberated on the prevention and cure of several diseases. 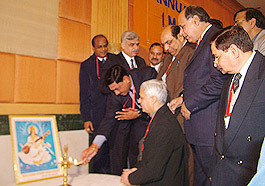 The president of the district unit of the IMA, Dr S.K.Menon, said Dr Gambhir also released a souvenir on the occasion. The conference concluded with a pledge to organise such programmes under the Continuing Medical Education (CME) scheme in view of their usefulness in updating the knowledge of practicing doctors. Another bull has been lying unconscious for the past two days. Unofficial reports put the death toll at more than 30. During the last winter season, more than 50 cows had died in the gosadan. At present there are 26 cows, including calves, and the ailing bull. The gosadan is only meant for D-category cattle (ailing or which could spread disease or are at the dying stage), but healthy stray cattle are also being lodged there. The healthy animals eat up the quota of fodder of ailing cattle and also cause physical injuries. Unauthorised cattle cause shortage of fodder, said sources in the Animal Husbandry Department. The sheds often become overcrowded and as a result the cattle pass the night in the open. There is no provision of lighting (except for a solar lamp) at the gosadan. Butchers from Uttar Pradesh have lifted several animals from the gosadan. The cattle attendant, Mr Sumer Chand, told The Tribune that on January 1 there were 52 cows and bulls in the gosadan. It is being alleged that officials do not make entry of all the calves lodged at the gosadan. Two other attendants (hired on ad hoc basis) said that there were more than 65 animals on January 1. (It is to be mentioned here that the twg temporary employees have not been paid salaries ever since they were hired four months ago). Sources said officials of the municipal committees of Jagadhri and Yamunanagar “forcefully” put stray cattle in the gosadan but did not provide fodder. The Deputy Director, Animal Husbandry, Yamunanagar, Dr J.P. Bansal, when contacted, admitted that officials of the municipal committees had been forcing cattle in the gosadan. “The MCs do not have any provision to lodge stray cattle and that is why the cattle are being forced into the gosadan,” said Dr Bansal. When asked about the shortage of fodder, Dr Bansal said that the department had purchased fodder for more than Rs 1 lakh during 2004-05. “The fodder was meant for D-category cattle only but the same was also fed to other cattle lodged,” said Dr Bansal. Sanitary conditions are very bad within the walled city area. The residents cannot remember the last time the roads and lanes of the inner city were cleaned or repaired. The safai workers of the Sonepat Municipal Council are hardly ever seen in these areas. With the formation of an elected body of members in the Municipal Council, the residents had hoped that things would take a turn for the better. But sadly, most of the members had other interests’. Most of the sewerage pipes have stayed choked for years together. The drains have not been cleaned and piles of garbage are usually left on the roads aggravating the problem. The situation in slum colonies is much worse. Heaps of garbage, pot-holed roads and absence of drainage facilities have resulted in the outbreak of malaria and other water-borne diseases. There is hardly any traffic regulation. In the absence of a road dividers in most parts of the city, it is free-for-all on the main roads. Encroachments on government and municipal land have become the order of the day. The bad condition of the roads, however, does not seem to bother either the PWD (B&R), the Municipal Council, HUDA or the Market Committee. Almost all main roads and the inner ones are in bad shape. Though these are repaired from time to time, the work is of such poor quality that it lasts only for a few days. Moreover, because of poor planning, the roads get damaged frequently. Frequent digging work for laying of underground cables by different departments and dumping construction materials on road berms also damages the roads. The city has a population of more than two lakh but has only about 13 tubewells for supplying drinking water which cover only 50 per cent of the population. Moreover, most of the water supplied is not fit for drinking. Hardly five per cent of the city has a proper open or underground drainage system. The unplanned growth of the city has led to serious storm drainage problem. In most of the areas, the storm water is drained through underground sewers which are often choked. Moreover, the mushrooming of unauthorised colonies on the periphery is seriously affecting the development of the city. There are about 50 such unauthorised colonies within the municipal limits which are fast growing into slums. There is a need for the authorities to wake up to the problems being faced by the residents and to take adequate steps to improve the situation. All families have at least one member suffering from one disease or the other. Husbands and wives in three families are suffering from leprosy. A woman in one family is blind and her husband has leprosy. Some of them are handicapped and some others have sustained burn injuries in different incidents of fire in the colony. But the only silver lining in otherwise dark clouds is that children of some of the families are attending school as their parents do not want them to beg. Bhagbai, who is blind and her husband Bhujwal (a leprosy patient) send their daughter Bhagwati to a government school. She is now in class I. Similarly, Krishne Mahli, daughter of Sheila Devi and Sham Lal, is studying in class XI in one of the government schools. Another couple suffering from leprosy, Bhulau and Ganga, have four children. Two of them go to school. When this correspondent visited the colony, some of the beggars wondered if we had come there to distribute fruits and clothes. When they came to know our identity, they started narrating their tales of woes. All of them answer the call of nature along the Jagadhri – Sharanpur railway line and have bath and wash clothes in the waters of the canal. In the rainy season, when the water level increases in the canal, they shift their hutments to roads and return when the water recedes. Filth and foul smell are permanent features of the colony. Government doctors rarely visit the colonies but those attached with the pulse polio drive have never skipped the colony. Like others they too demand potable water and power supply but they do not expect to get either at least for another decade. According to them, the politicians do not take interest in their development and rehabilitation, as they do not have votes. “Even officials of the Municipal Committee do not bother to visit us”, complained Bamnu Lohu, who is suffering from leprosy. His wife Kodiya too suffers from the same disease. According to information, the deceased were identified as Surender (30) a son of Suraj Bhan and Anoop Singh (32) a son of Chander Singh, both residents of Madanheri village in Hisar district. The bodies were lying some distance away from the car and some empty bottles of wine were also recovered from the spot. The police sent the bodies to the Civil Hospital for a post mortem examination. While the family members of the deceased had also rule out any foul play in the accident. Pawanjit (55), a resident of New Hamida Colony, was killed when a tractor-trailer hit his car on the Bilaspur-Jagadhri road near Chhahro village on Friday. In another incident, five passengers of a three-wheeler were injured when another three-wheeler hit it in the camp area.